Can you imagine a man’s closet without the much essential dress shirts? 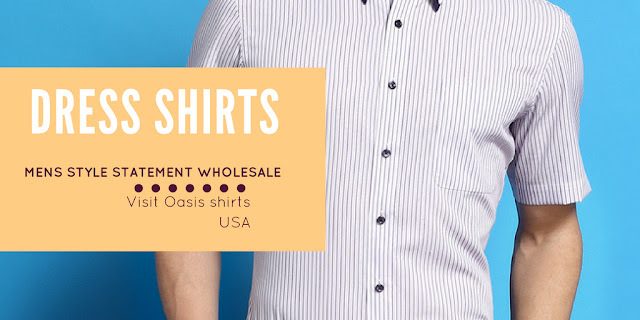 They are classy, smart, and edgy, helping men to deal with a range of style woes.These shirts are highly versatile and are available in different styles and designs, from super casual to sophisticated formal and much more. The dress shirts have different sorts of collars and cuffs, and these details define the style they offer. Well, there was a time when the dress shirts were just a part of a man’s attire and came in lesser color options, hardly neutrals. They were worn as undergarments with coats, blazers, and jackets.With passing time and changing style trends, this became the ultimate stand-alone fashion quotient for the style conscious men. Today, the wholesale men dress shirts are available in an array of color schemes, fits, silhouettes, and designs. If you are not aware of the rules to dress up in these dapper shirts, you should avoid going over the top and start slow and easy with safe colors and patterns. With time, you will gain more confidence and knowledge and this will help you grow through the right style of wearing them, and push you to experiment more. This year, the design houses have introduced the widest range of wholesale dress shirts for men. Are you looking for something subtle yet stylish? Then you can easily go for the oxford stripe slim fit dress shirt range that comes in subdued color combinations, like white and blue, or grey and white or black and white.These shirts look great with trousers for office meetings or denim for date nights too. The fusion of contemporary and classic is wonderful and you should definitely own the black/white gingham dress shirt, with double pockets on one side. This shirt genre is very modest looking, and can be worn to parties or to the office with equal grace, through styled differently. The soothing floral printed dress shirts for men are summer perfect, and also a great option for vacations. Go for white and blue or pink and white color combinations and team them up with the white trousers, denim or grey chinos for the most appealing ensemble options possible. For a grunge style stance at night around the town scenes, you can always rely on the red and black classic buffalo check shirt. Make sure it is slim fit in style and offers a wonderful silhouette, helping you to flaunt your assets successfully, crafted by a leading mens designer dress shirts wholesale hub.